VEROSIM Solutions is your partner for the application of innovative 3D simulation software in your business. Our team is responsible for the practical technology adoption in industry. Solutions: VEROSIM Solutions offers solutions for your business. Well-engineered innovations are efficiently integrated into your daily routine and help you to get even better. Transfer: RIF brings new and modern methods into your business. Together with you, practical prototypes from scientific ideas and new technologies are developed. 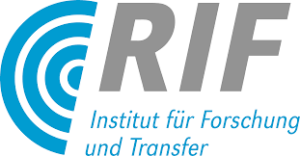 Research: The Institute for Man-Machine Interaction MMI of the RWTH Aachen University designs trendsetting research projects and develops the scientific basis of your issues of tomorrow. VEROSIM Solutions is a technology leader in the field of 3D simulation. Together with our customers, we use 3D simulation to analyze processes, machines, plants and products that are either not yet realized, not available or with which real experiments would be too dangerous. Virtual test environments, so-called virtual testbeds, for highly complex systems in the areas of environment, industry and space, enable meaningful analyses. A 3D simulation can be done interactively, in real time and with high display quality. Our 3D simulation software can be used to view technical details on a workstation as well as to present abstract relationships in a Virtual Reality facility. As a new customer, you begin to work on your current problem and can rely on the ability to handle future tasks with the same software. And if you ever have a very specific problem that requires the expansion of the software, you can rely on our support. Examples of 3D simulation applications can be found on our YouTube channel. If you have any questions, please contact us. VEROSIM Solutions helps you bring virtual reality to your business, whether it’s a corporation, medium or small business. Use stereo 3D presentations to impressively highlight your products, processes, machines, systems or objects. Transform your meeting room into a VR studio without much effort or place an eye-catcher in your entrance area. Virtual Reality can also be used on-the-go with your customers on site or at trade fair stands. Our VR systems scale from ultra-mobile systems for about five people to walk-in panoramic projection systems for up to twenty people. Your company already uses 3D design data? In this case, you can prepare your content in no time on your own for Virtual Reality. Viewers can navigate the scene and, if they wish, interact with objects, such as operating a machine or manipulating an assembly. You can decide on the complexity of the presented processes yourself. This way you can discard any motion, map a process at a high level of abstraction in a highly simplified way or model the complete process in a technically exact way – right through to the use of original controller programs. Take a look at the videos on our YouTube channel. They show content that can be displayed in virtual reality in real time and interactively. For all other questions, we look forward to hearing from you.